This is an origin story within an origin story. It also required a significant amount of detective work, in more ways than one. I was initially hesitant to write any logic problems for Knossos Games at all. There is a vast history of logic problems, with a great deal of diversity and detailed analysis of practically everything. I have high standards for the puzzles I write, especially in terms of their uniqueness and originality, and I wasn’t sure if I could add anything to this category of puzzle. A particular logic problem that I saw convinced me otherwise. The Coin Box problem was my very first attempt at a logic problem. During my early days of puzzle making, I tended to emulate or improve puzzles I encountered, and this one was no different. I created this problem based on another logic problem, but I never had a copy of that original problem, and that’s because of the way in which I encountered the problem. During the summer of 1997, I was a teaching assistant at the Frederick, Maryland CAA site for a class called “Mathematical Investigations”. (Sadly, this course no longer exists. This discrete math course currently offered is the closest, but there is only a small amount of overlap in the content, and I have no idea if they are taught in the same way. I should also note that CAA doesn’t exist anymore either. CAA summer courses are now called CTY: Academic Explorations, while the original CTY summer courses are now called CTY: Intensive Studies.) These summer program courses meet all day long for three weeks, so in addition to the main topic we covered each day, there were a lot of supplementary activities. One of those was a recurring competition between the students. The class was broken up into a few teams, and the instructor and I would give them a new puzzle or math problem every three minutes on the overhead projector. The members of each team would have to work together to make sure they copied down the relevant information needed to solve each problem as well as actually solve them all before the competition ended. Of course, the team with the most correctly solved problems won. One problem we used in one of the competitions had a grid of 16 numbers. The puzzle had a couple of simple clues about how to arrange the numbers in the grid. The problem was only looking for one specific number, and thus it was unnecessary to fill in the entire grid to get the answer. I wondered if I could make a similar puzzle, only make it so that each clue was necessary to complete the entire grid. That description constituted the brief yet official history of the Coin Box problem. Years later, I found a book of problems that seemed very familiar. 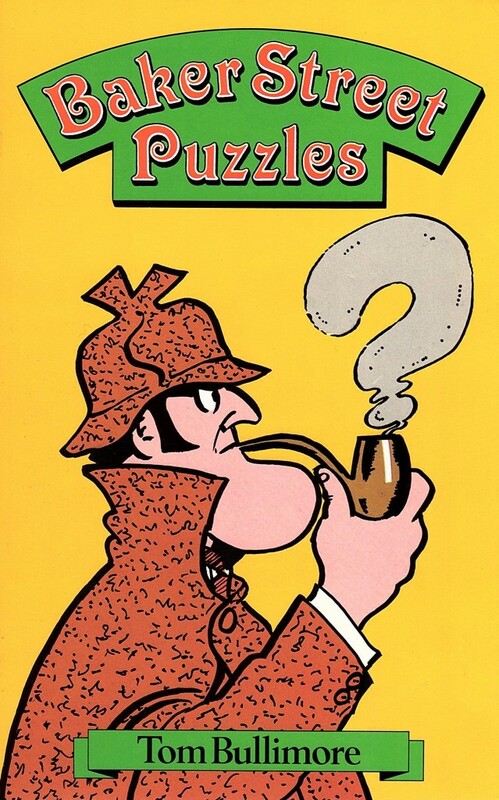 Baker Street Puzzles by Tom Bullimore is a collection of short problems, puzzles, and brainteasers using Sherlock Holmes and Watson as a cover story. I immediately recognized a few of the problems in the book as ones from the competition. I dug through my filing cabinet and found a solution sheet for the problems we used in one of the competitions. The problem numbers for each solution matched those given in the book, so I knew I had found the source of the problems the instructor used. Is this where I got the idea for the Coin Box problem? Perhaps I misremembered the details from the problem seen in competition. If this is the source problem, why would I have found inspiration in this particular puzzle? Only in trying to solve this puzzle did I start to realize why I might have wanted to recreate it. 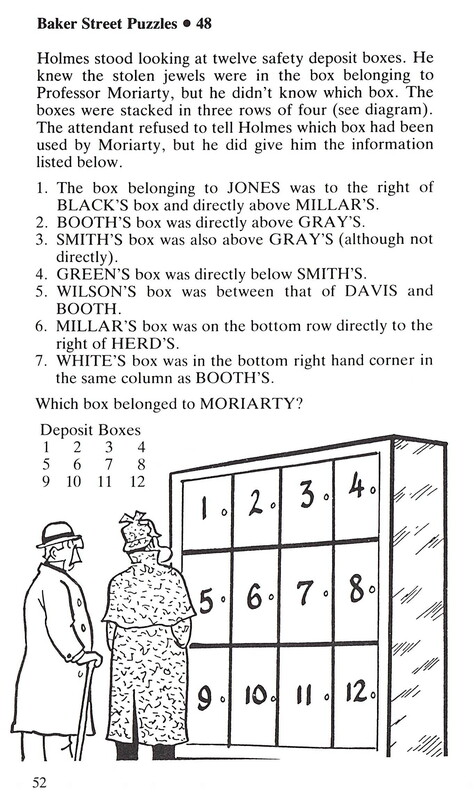 Look at clue #3 above: SMITH’S box was also above GRAY’S (although not directly). What exactly does that mean? What is the difference between “directly above” and just “above” (not directly). Clues #1 and #6 also give a distinction between “directly to the right of” and “to the right of” (not directly). I can think of two possibilities. In one interpretation, “directly above” could mean that the two boxes are touching, where one is right above the other, while “above” could mean in the same column, but not necessarily touching. (Saying that one box is above another does not preclude that it is, in fact, directly above it, so this doesn’t force the “above” box is in the top row and the “below” box is in the bottom row.) Alternatively, “directly above” could mean in the same column, while “above” could simply mean that the “above” box is anywhere in a row above the “below” box. These interpretations are very different! And nowhere in the puzzle is it clear which we should use. I decided to chart out all the possibilities. Depending upon how you interpret “directly above”, “directly to the right of”, and “between”, this yields many, many solutions to the problem, shown below. What I believe to be the intended solution is highlighted in blue. As it turns out, for the solution given (that MORIARTY’S box is #9, matching the above presumed solution), “directly” is used consistently to mean touching, although sometimes this is a choice, and other times clues force you to interpret “directly” as touching. However, the generic “to the right of” (clue #1) is forced to be in the same row, while the generic “above” (clue #3) is not in the same column. Again, there is nothing in the stated clues that makes any of this clear, and thus I would claim that there are alternative, valid solutions of boxes 5, 6, 7, 10, and 11. In the Coin Box problem I wrote, it seems fairly clear that I was responding to this language problem. The clues I used only contained references to “directly” above and below, and never generally above and below. (I also added several clues that relied on numerical properties of the values involved.) In updating the puzzle for the new website (and in thinking through this blog post), I decided to include language defining “directly”. Even though its usage can be deduced from the puzzle itself, since in several cases “directly” must mean contiguous and thus should be used consistently, that possible ambiguity is not what I want to be part of what makes the problem difficult. It is still possible that this problem is not what generated the Coin Box problem. I think it is more than likely, given the similarity of the clues and the correction of some of the source problem’s ambiguities. Even with the distorted narrative I had in my notes, there is more here that verifies the origin of the first logic problem I wrote than refutes it. New ideas for puzzles come to me from anywhere and everywhere. Often times they come from everyday experiences, and through ideas I contemplate at my actual job, but I also like to check out puzzle books, magazines, and websites to see what other puzzlemakers are doing. Sometimes I see a puzzle that’s great, and I want to emulate it. Other times I see a puzzle that was based on a promising idea but was (in my opinion) poorly executed, and I think I can do better. In this continuing series, I’ll share where my new puzzle ideas come from. There is one more story about the Space Pods puzzles I wanted to tell before moving on to other things. 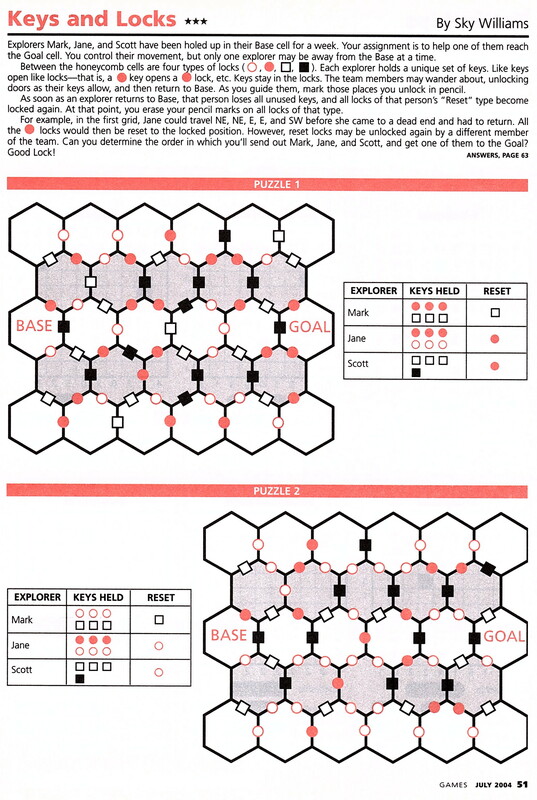 I dug through some stuff and managed to find the puzzle from Games magazine that inspired the first Space Pods puzzle. I thought this puzzle had some interesting ideas. However, I also thought the way it was constructed was convoluted and cumbersome. I like complex puzzles, but I find ones that have overly complicated rules to be tedious and unnecessarily torturous. As you can see in the instructions above, three people move around the hexagonal grid unlocking doors. But each person has a certain number of specific keys, which can only go in specific locks, and once they run out they have to return to “base”, and then some of the doors re-lock, but some stay open. These details have to be summarized in a chart for each puzzle. This puzzle is difficult because you have all of this junk that you have to keep track of. (The author even senses this – note that the instructions contain a suggestion of how to keep a record of which doors are unlocked.) Not exactly my idea of a fun puzzle-solving experience. Despite this sentiment, I thought that there were some unique ideas contained in the puzzle that I wanted to explore. I had used two people helping each other in the Double Jumping puzzles, so why not try three people? I liked the hexagons, because it would open up more possibilities for connecting rooms together compared to a square grid. And I liked the idea of doors and locks that would be unlocked and re-locked. I kept the three people, but now they work together, instead of sending one out, then another, then finally the third person. And the objective is no longer that just one person makes it to the goal (which never made sense to me), but that all three have to get there. I ditched the standard hexagonal grid by adding hallways. This helps connect non-contiguous hexagons and opens up the puzzle, but also precludes using a distance-to-goal heuristic while solving, which makes the puzzle harder. The most important change was simplifying the procedure of unlocking and re-locking doors. Instead of charts explaining who had what keys, the door locks would be dependent upon where the people were in the puzzle space. Thus the “chart” becomes part of the puzzle space itself (which makes it a lot easier to keep track of who can open which doors when). Consequently, the rules are vastly simplified, but the puzzles can actually be more complex, depending upon how large the space is and how many steps there are to solve the puzzle . All in all, I think it’s a big improvement. My thanks to Sky Williams and Games magazine for inspiring me to make a puzzle using three people unlocking doors together. Oh, and in case you were wondering, here’s the solutions to the above puzzles.